FINANCIAL DISTRICT — A bank robber made off with $1,000 in cash after demanding money from a teller at a downtown Chase branch, then fleeing in a taxi, police said. An employee at a Chase at 214 Broadway told police that at 9:50 a.m. on July 21, a man in a blue plaid shirt, blue jeans, and a dark navy blue hat with lettering entered the bank and handed a teller a note that read, “Don’t look at me. Give me all the monies out of the draw,” then threatened to shoot people if he was not given any. 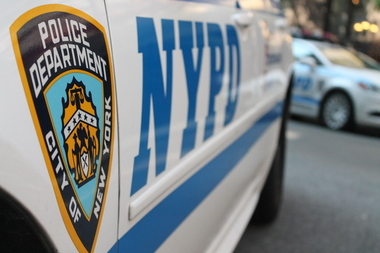 The teller, a 53-year-old woman, handed the suspect $1,000 in cash, whereupon he fled the location on foot and hopped into a yellow cab at Broadway and Park Row, police said. The taxi was last seen heading northbound on Park Row, and then on the Verrazano Bridge, according to police. It’s unclear whether the suspect was driving the cab or merely a passenger, and the Taxi & Limousine Commission was unable to provide further information regarding the incident. The suspect was described as a 45-year-old man, 220 pounds and 6-foot-2, police said. There were no arrests as of Tuesday. An Chase Bank employee declined to comment. ► Jiajia Chen, 22, was arrested on July 30 and charged with grand larceny after she swiped $7,320 worth of high-end goods from a Saks Fifth Avenue outpost at 225 Liberty St., officials said. Chen used a forged Saks Fifth Avenue credit card to buy three jackets and two handbags just before she was arrested, according to a criminal complaint from the Manhattan District Attorney’s office. Her attorney did not immediately respond to request for comment, and a manager for Saks was not immediately available for comment. ► Three suspects are accused of stealing five women’s belts totaling $1,975 from a Salvatore Ferragamo location at 230 Vesey St. on July 16, police said. An employee told officers the suspects entered the store and took the property from display shelves before leaving without paying for them. A manager at the store was not immediately available for comment, and police said there were no arrests as of Tuesday. ► A 28-year-old Manhattan woman was robbed and assaulted by three teenaged girls while onboard a downtown 1 train on July 21, police said. The victim told police the train was approaching the Chambers Street station when one teen punched her in the face, while another stole her Michael Kors purse. The two fled the subway car, and a third teen pushed the victim and told her, “No, don’t follow,” police said; the teens then took the woman’s debit card, MetroCard and $20 in cash before discarding the purse on the platform, according to police. The NYPD said the suspects were approximately 14 to 16 years in age, and note there were no arrests as of Tuesday. ► A man attempted to rob an Apple Savings Bank at 110 Church St. on July 22, but left before taking any money, police said. An employee told police the man, who was wearing a blue hat, blue jeans and a maroon shirt, entered the location and handed a note to a teller, which read, “This is a robbery, give me all your money.” The employee handed the suspect back the note, whereupon he fled the scene, police said. There were no arrests as of Tuesday, and no one at the Apple Savings Bank was available to comment.